Today is the very first day of my new blog, I hope to add new information every week to discuss this process of making art. Drawing is the absolute foundation of every painting. It’s the connection from your eyes/brain to your painting surface, without it there is a disconnect. You see something you feel passion for, with wonderful shape and shadow, you take a picture and when you look at the developed picture, you can’t for the life of you, see what it was that you wanted to paint. Frederick Franck says, “We do a lot of looking, through lenses, etc…our looking is perfected every day, but we see less and less.” Cameras and computers are taking over our experiencing and seeing. Unfortunately, by relying on these wonderful technical skills, we have lost confidence in our own ability to record a scene that we wish to make into a composition. As an artist, by creating paintings, you are helping your viewer to see that which he cannot and you can regain your ability, just by exercising your drawing skills. To that end, I recommend that you draw a little every day, nothing lengthy, just 20 minutes, a still life, landscape, your shoe, you always have your hand with you, put that into an interesting position, just do a line drawing, no shading. 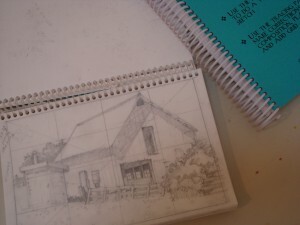 Carry a small 8 1/2 X 5 1/2 sketch book with you all the time. So many times, waiting for my children I would take out my sketch book and sit in the car and draw what I saw out my windshield. 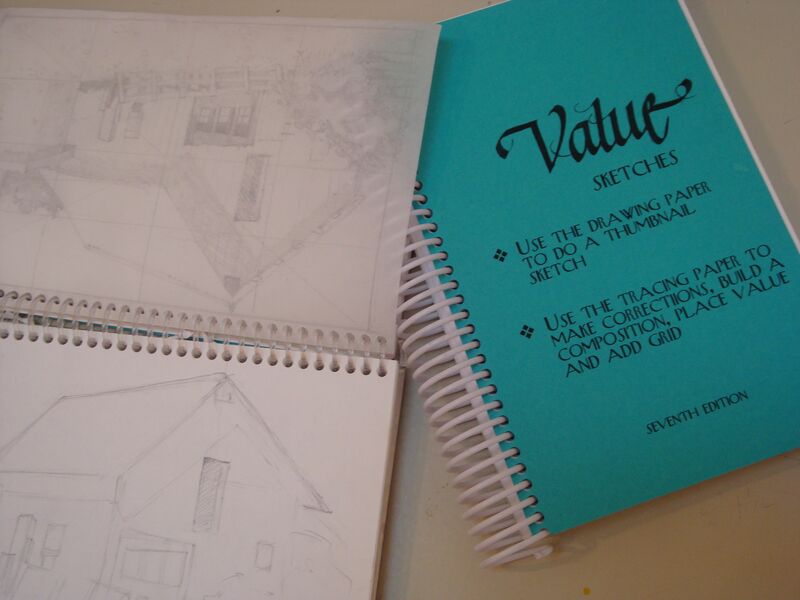 I have designed a book, just this size that has drawing paper, collated with tracing paper, you can do the line drawing and if you are working toward a composition, turn over the tracing paper to give it value. Next week I will talk about my method of drawing, used by the masters. 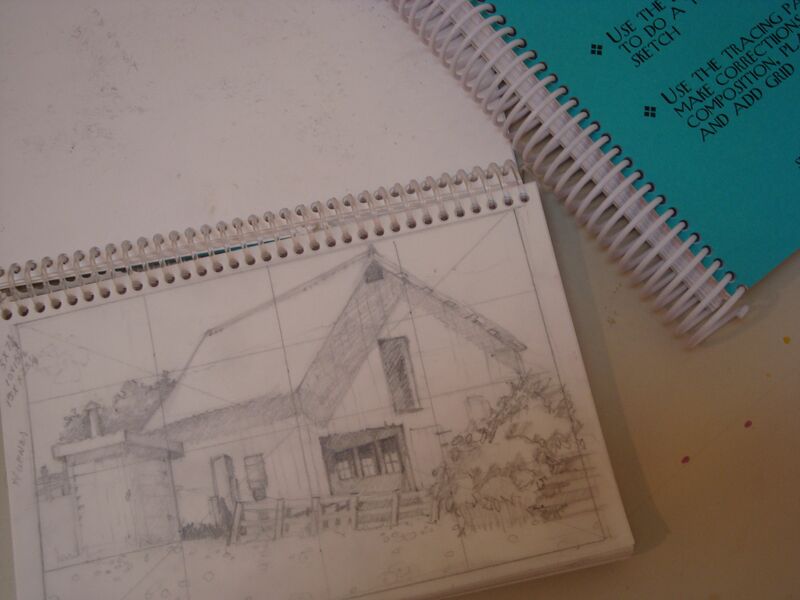 The second picture is a drawing which I have added the tracing paper to, with the idea of putting in the values. It helps me decide how it will be as a composition, as essentially solving many of my design problems at an early stage. But at this point, what you are wanting, is to draw, to see, to regain your ability to take off the labels, this is a tree, this is George’s nose, or eye, this is a vase and daisy…and see all the uniqueness around you. Talk to you next week, try to do some drawing. I am couldn’t be a prouder granddaughter! I love you so much! And I am going to start drawing at least once a day. I think that will really help me even regain some peace and serenity. Thank you for taking the time to read my blog, it means a great deal. You are wonderful. Love this blog- keep sharing! Thank you Kathy, got your messages and appreciate them so much. Thank you for the drawing lessons! You write and teach as well as you paint! I have one of your watercolors from probably 15 years ago. The two women talking over a fence, and lilacs…I love it so. It continues to be a gift, warming the space it occupies, speaking volumes. Just thought I’d see what you were up to these days. I’ll visit again. Your blog is great . 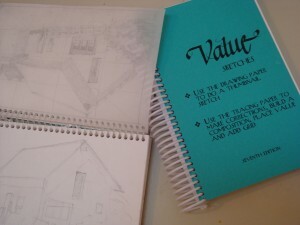 I’m glad you chose to emphasize your philosophy on drawing – it helps me for you to say it again and again!